Intense on-field action, passionate fans and a local beer garden are just some of the many reasons to take in a game. Photo courtesy: Bellingham Sportsplex. 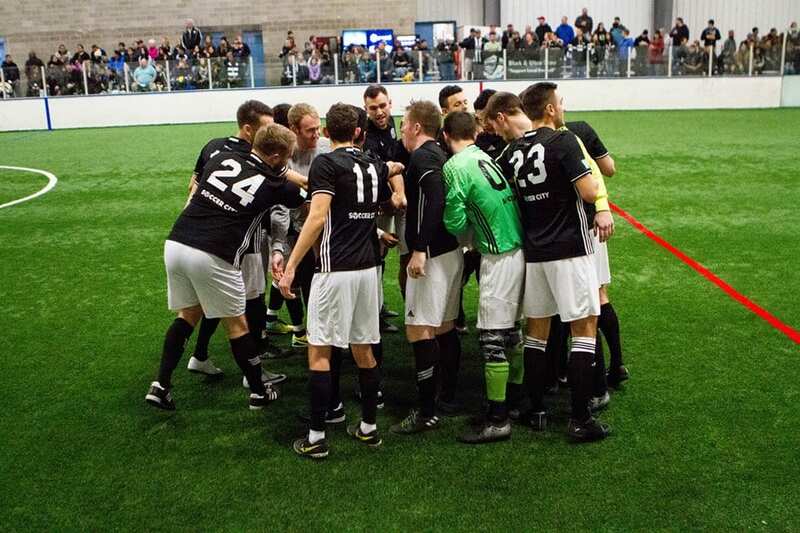 While winter weather in Whatcom County is often less than ideal for seeing a soccer game, the Sportsplex offers the perfect solution: indoor soccer courtesy of the Bellingham United Football Club. This semi-professional team is in its fifth season as the United, having previously been called the Whatcom Soccer Academy Rapids. The Bellingham United FC bring the excitement of indoor soccer to the Sportsplex each November to January. Photo courtesy: Bellingham Sportsplex. 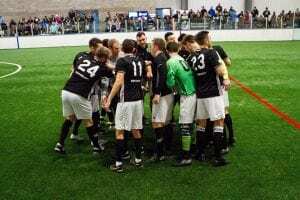 The United have won three consecutive Western Indoor Soccer League (WISL) championships entering this season, and have an excellent shot at a fourth. They also have a nearly 30-game home win streak, as of this writing. John Ayre, team president, says each home game brings in hundreds of people and provides a fun and intense atmosphere. More than 700 people attended last year’s championship game. It’s also a high-scoring affair. While outdoor soccer matches often see 1-0 finals, indoor matches regularly put those numbers to shame. At one game this season, the United scored 14 goals on their opponent. The team is comprised of men from their early 20s into their 30s, and players’ goals for being part of the team differ; some simply play for the love of the sport, while others hope to use their time in Bellingham to garner tryouts for larger teams elsewhere. Regular season matches run from November until the end of January, with the postseason lasting into mid-February. For tickets, visit the Sportsplex ticketing page. Admission to all home games is just $8 per adult, and $5 for youth, seniors and students. Family admission tickets are also available for $20. Season passes are an incredible value as well, ranging from just $20 for youth, students and seniors to $32 for adults. For more ticket information, including group ticketing deals, contact marcr@bellinghamsportsplex.com.